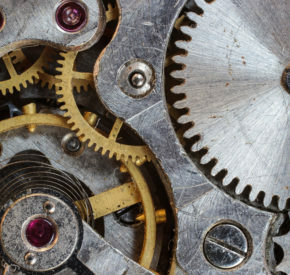 One of the most important types of emails you send to your customers are the automated notifications related to order status. These transactional emails have the highest open rates of any type of eCommerce email, and among the most important is the receipt email. From here, you can create a new notification, and one or more emails that can be sent for that notification. You’ll start with a “default” notification email that’s sent to everyone, but you can add alternative emails to replace that default. For example, you can send a different receipt to high-value customers than other customers, or send a different receipt for unpaid orders vs. paid orders. 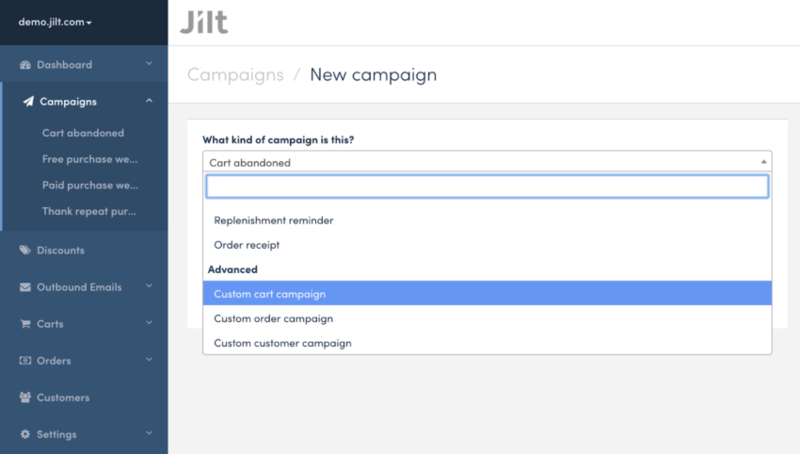 Using Jilt to power your receipt emails means your receipts can be richer and more valuable for your customers. 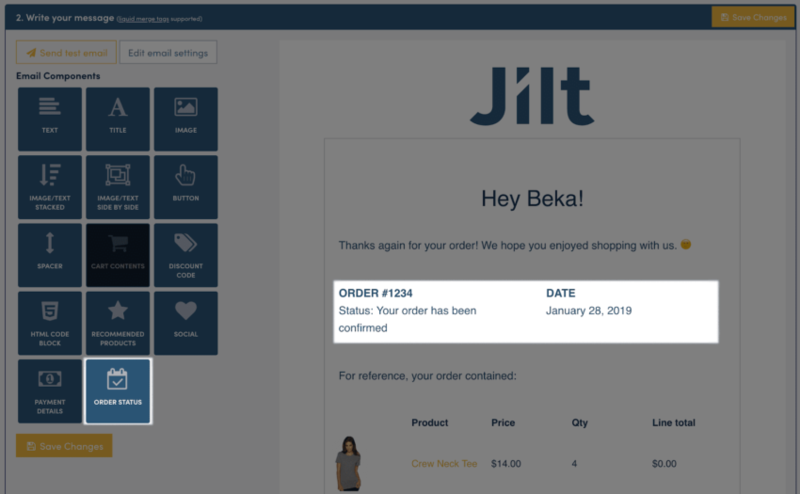 Your receipt emails will have access to all of the order or customer information you can add to any other email you send with Jilt. This feature will be coming soon to WooCommerce and Easy Digital Downloads stores, as well. One of the main considerations we weigh when developing Jilt is ease of use—we want to find ways to make it easier for you to send great emails to your customers. Our drag-and-drop email editor helps you put together effective campaigns fast, so it’s an area of Jilt we continually try to make better. We recently rolled out a number of improvements to the email editor designed to make your emails richer and make your life easier. We added an order status block that lets you place vital order information, like the order number, status, and order date, in any email you send. This is important for receipt emails, but is also useful for other order campaigns. We also added a payment details block to the email editor that shows billing address, order total, and payment method. We made it much easier to control the size of your logo in emails. Simply pull the logo slider right (bigger) to left (smaller) and watch your logo resize in real-time in the live preview. The slider can be founder under the logo settings by clicking on your logo while editing an email. For more advanced users, we’ve added support to a number of new liquid merge tags. Liquid tags allow you pull dynamic details into your emails, like a customer’s name or product and order details. You now have access to over six dozen liquid merge tags (not including additional tags available through our WooCommerce Subscriptions and Memberships integrations) and you can find the full list available here. Previously, when you connected a new shop to Jilt, we only imported 30 days of historical order data. This made it hard to send certain emails like replenishment reminders or win-back campaigns, for which you might need to know about a customer’s order from a couple months ago. We now important all previous orders, which means you can now start sending emails based on past orders immediately! Full historical order import is available on Shopify now, and coming soon for WooCommerce and EDD stores. 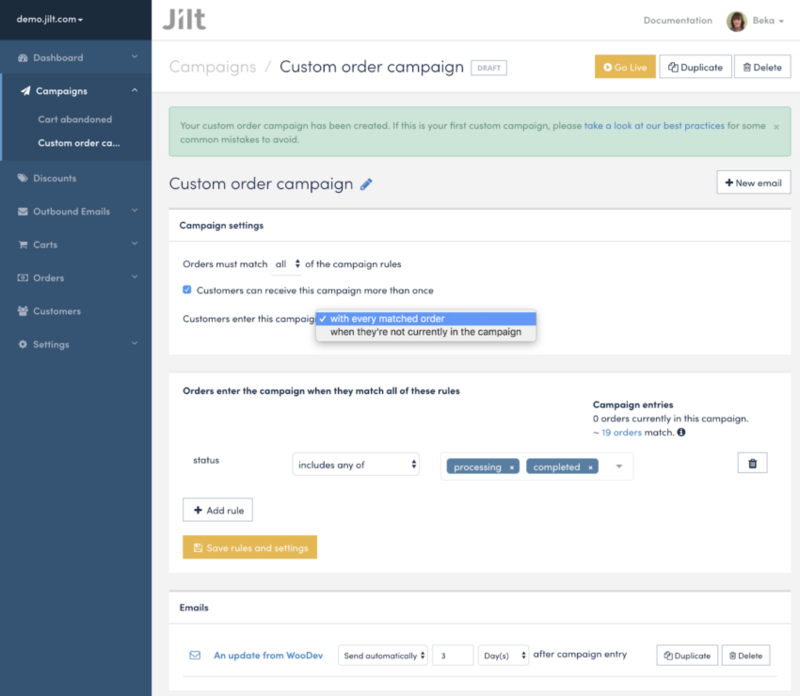 Jilt email campaigns just got a whole lot more powerful because now you can select multiple values for campaign segmentation rules. Previously, you could only choose “status is X,” but now your can choose “status is any of: X, Y, Z” to make it easier to target multiple values at once. This is helpful for properties like order statuses, membership or subscription statuses, and more! Using a “list” rule type helps you target a wider audience without the need to create multiple campaigns. You can choose to create either a cart, order, or customer data campaign. WooCommerce stores may also have membership and subscription campaigns available if those integrations are active. 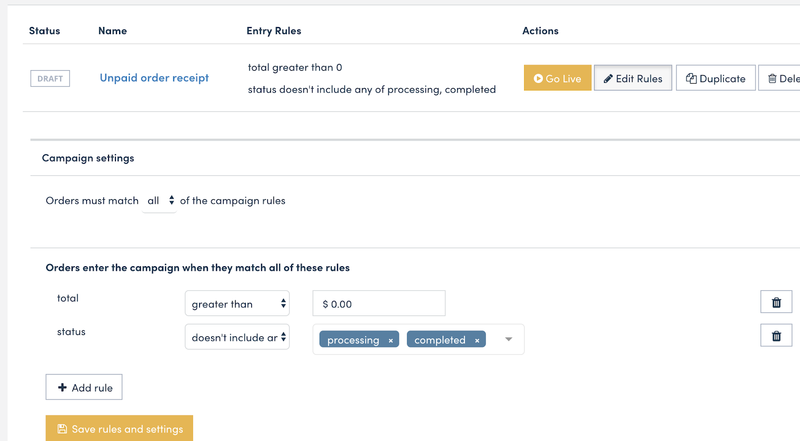 Once you set up a campaigns, you’re free to configure the campaign settings and rules however you want! No template rules (static or editable) are added. Remember: with great power comes great responsibility, so read the best practices before you use custom campaigns.